The study is a survey of the traditional uses of plants in the Ancona district, in the Marche region, Central Italy. 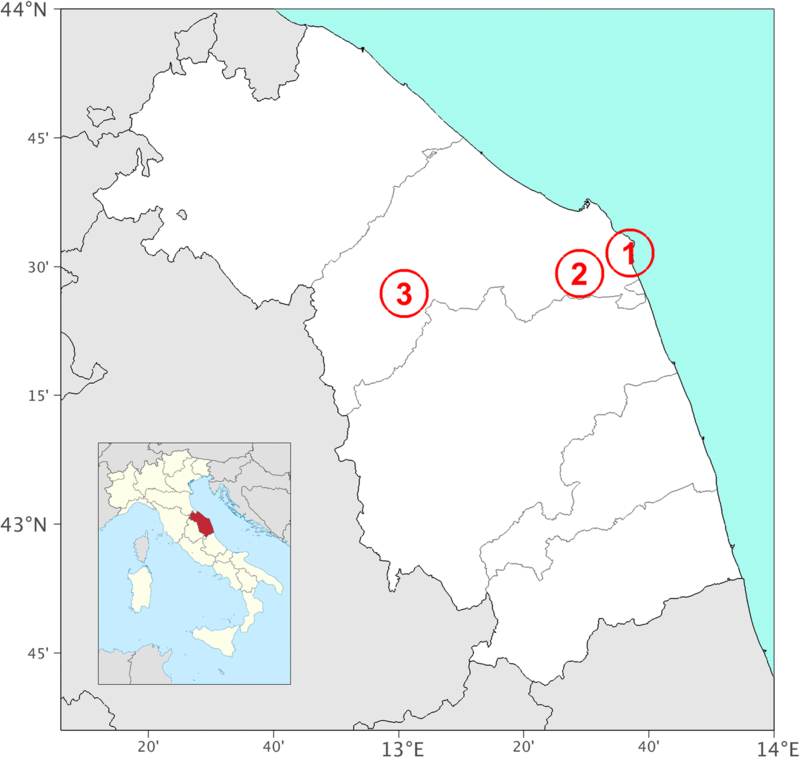 The information derives from ethnobotanical investigations conducted with an open questionnaire among the rural population in three areas of the Ancona district that are representative of the socio-economic and environmental assets of the entire district: the Mount Conero area on the Adriatic coast; the municipality of Osimo, as an inland hilly area; and the ‘Gola della Rossa–Frasassi’ area, in the Apennines. A total of 120 informants cited 195 species. The ethnobotanical data concern medicinal (122 species), food (119), veterinary (53), superstitious/religious (61), cosmetic (30), domestic (27), dyeing (17), recreational (17), repellent (15), craft (10), and miscellaneous (29) uses, along with inclusion in local sayings and proverbs (25). The species with the greatest number of categories of use here was Sambucus nigra L. Among the other species with the greatest numbers of categories of use, there were Matricharia chamomilla L., Salvia officinalis L., Urtica dioica L., Papaver roheas L., and Rosa canina L. For each use, comparisons with national and regional literature were made. Some uses are commonly known across the three areas; others are sectoral and are new for the Marche region. The survey increases our present-day knowledge of the traditional local uses of plants in the Marche region, in terms of medicinal and food uses, and of ethnobotanical aspects as a whole, which will allow many of these uses to be preserved in the future. The use of wild plants in Italian rural communities was a common practice, especially in the traditional sharecropping rural society of Central Italy that was largely based on self-sufficiency through self-consumption . In this kind of society, in addition to the most common kind of uses as medicines and food, a lot of plants were used for many different aspects of daily life, such as craft work and home tools. However, the rural culture that included the knowledge of the use of spontaneous plants began to fragment from the second half of the twentieth century due to the progressive depletion of the population of the countryside, and to urbanisation and widespread industrialisation [2–4]. The use of sharecropping contracts ended in 1964 also in the Marche region, and this led to changes in the production structure, with the spread of large-scale agriculture that was disconnected from the territory itself. This contributed to the loss of identity of the rural society, and of its knowledge and traditions. Research such as the present study can contribute to the conservation of the knowledge related to traditional practices, which are now fragmented and remain almost exclusively with older people . The present study collected and analysed the knowledge of ethnobotanical uses that are still widespread in the Ancona district, and considers not only medicinal and food uses, but also veterinary, superstitious/religious, cosmetic, domestic, dyeing, recreational and repellent uses, and craft uses for wood, and cases where plants are mentioned in sayings and proverbs. Three areas among the rural populations of the Ancona district that are representative of the socio-economic and environmental assets of the entire district were chosen for this study: the Mount Conero area on the Adriatic coast; the municipality of Osimo, as an inland hilly area; and the Gola della Rossa–Frasassi area, in the Apennines. Identify new uses according to the Ancona district. These ethnobotanical studies were conducted in three different areas in the Ancona district (Marche region, Central Italy). The Ancona district is one of the five provinces of the Marche region, and it includes a small area of the Apennines (34%), and wider hilly inland areas with flat stretches and an extended coastline, which together account for the remaining two thirds of the territory [6, 7]. The three areas of this study were thus designed to fall into each of these three sectors: the Mount Conero area on the Adriatic coast; the inner hilly area of the municipality of Osimo; and the Apennine area of Gola della Rossa–Frasassi (Fig. 1). The Mount Conero area extends along a coastal strip in a central position of the Marche region, and it includes part of the municipalities of Ancona, Camerano, Sirolo, and Numana. On the basis of the bioclimatic indices of Rivas-Martinez et al. , the territory of Mount Conero belongs to the Mediterranean macrobioclimate, with a pluviseasonal oceanic climate, upper meso-Mediterranean thermotype, and low subhumid ombrotype . The territory is mainly hilly, and Mount Conero is the highest peak (572 m a.s.l.). Thirteen percent of the territory is urbanised , and 50% is dedicated to agriculture . The economic enterprises are mostly tourism and manufacturing . This area includes the Mount Conero Regional Natural Park (Parco Naturale Regionale del Conero), which covers a total area of 5914 ha, and is characterised by different habitats of high floristic and geological value. These include three Sites of Community Importance (SCI) and one Zone of Special Protection (ZSP). The prevailing plant landscape in the central core of Mount Conero is constituted by woods of evergreen sclerophylls that alternate with reforestation with conifers and deciduous forests. Along the cliffs above the sea, there is rupiculous vegetation and Mediterranean scrubland. The more internal hilly areas mainly comprise agricultural landscapes that are mixed with oak woods (Quercus pubescens Willd. ), hygrophilous vegetation along the water courses, and broom shrubs (Spartium junceum L.) that colonise the abandoned fields. The flora includes 1169 entities , some of which here reach the northern limits of their distribution along the western Adriatic coast, including Ampelodesmos mauritanicus (Poir.) T. Durand and Schinz, Coronilla valentina L. and Euphorbia dendroides L. In this area, the ethnobotanical surveys were conducted in the municipalities of Camerano, Sirolo (a hamlet of San Lorenzo, Coppo) and Numana, and in the hamlets of Poggio and Massignano in the municipality of Ancona. The municipality of Osimo extends over 10,600 ha, and the territory is mainly hilly (highest peak, Monte della Crescia, 361 m a.s.l. ), and it alternates with valleys near the Musone River. The macrobioclimate is temperate with a sub-Mediterranean variant, lower mesotemperate thermotype, and lower humid ombrotype . This territory is predominantly agricultural, with marginal environments that are characterised by natural and semi-natural vegetation, with some residual woods that were the subject of recent studies [13, 14], and some riparian areas. Osimo has a population of 34,918 inhabitants (ISTAT 2017) and is classified as ‘level 2’ in terms of its degree of urbanisation (ISTAT 1 January 2018) . The local enterprises are mainly based on manufacturing , and cultivation covers 7310 ha. In this area, the ethnobotanical surveys were conducted in the hamlets of Campocavallo, Passatempo, San Sabino, Padiglione, San Paterniano, and San Biagio. The third area is located in the mountain sector of the province of Ancona, and it falls partly within the Regional Natural Park of the Gola della Rossa–Frasassi. The territory is mainly mountainous (highest peak, 1093 m a.s.l.) and consists of the two limestone gorges ‘Gola di Frasassi’ and ‘Gola della Rossa’, and includes also Scappuccia Valley and Valdicastro Valley. The bioclimate is temperate of the sub-Mediterranean variant, upper mesotemperate thermotype, and lower humid ombrotype . The vegetation of the mountain areas is mainly mixed deciduous forests that are dominated by hornbeam and flowering ash, and at higher altitudes, beech and grasslands with shrubs. The calcareous gorges with southern exposure host Mediterranean sclerophyllous woods and rupiculous vegetation, with the presence of endemic species, including Moehringia papulosa Bertol., which is endemic to the Marche gorges . In the lower areas of the valleys, the landscape is agricultural, with cultivated fields alternating with small residual woody nuclei, with hedges, shrubland, and margin vegetation. The population is mainly concentrated in the urban centres of the park, with the production activities located at the bottoms of the valleys, as relatively fragmented agricultural activities. In the area of Gola della Rossa–Frasassi, the ethnobotanical surveys were conducted in the hamlets of Castellaro, Trivio, Forchiusa, Serralta, Sasso, Montirone, and Sant’Elena, and in the municipality of Serra San Quirico. The ethnobotanical surveys were conducted in the small towns and rural villages of the three areas in the Ancona district between 2008 and 2011, and involved a total of 120 people, defined as the ‘informants’. These informants were not chosen completely at random within the territories, but were chosen through selection of individuals who according to their ages (more than 50 years of age) or cultural or social backgrounds would have knowledge of the plant uses, either directly or as passed down by their families. This was achieved by means of word of mouth from some known contacts to identify relevant informants, using the ‘snow-ball sampling’ method . The informants were initially introduced to the aims and methods of the interviews, and then asked for their consent to proceed. Before proceeding with the interviews, it was ascertained that the informants were native to the particular survey area, in terms of being born and raised there. During the interviews, the informants were asked open questions, such as “Which plants were used, and for what use? How were these plants used, who collected them, and where and when? Were there sayings or proverbs related to any specific plants?” Data were also collected on the informants, in an anonymous form, as year of birth, initials of name and surname, gender, level of education, and work activity. Italian was used as the language of the interviews. Table 1 includes the local names of the plants that were collected, where sometimes the local names were different across the three study areas. Capsella bursa pastoris (L.) Medik. Pastinaca sativa L. subsp. urens (Req. ex Godr.) Celak. Picris hieracioides Sibth. and Sm. During the interviews, observations were often made in the field to identify the species used; alternatively, fresh samples of plants or their pictures were shown to the informants. Voucher specimens are stored at the ‘Herbarium Anconitanum’ (ANC) of the Department of Agricultural, Food and Environmental Sciences of the Polytechnic University of Marche (UNIVPM). Identification of the species was carried out on the basis of ‘Flora d’Italia’ , the updated nomenclature was based on online databases [18, 19] and the classification in botanical families was the one proposed by Angiosperm Phylogeny Group (2016) . The uses of plants that were revealed in the interviews were grouped into 12 categories: (1) medicinal; (2) food; (3) superstitious/religious; (4) veterinary; (5) cosmetic; (6) domestic; (7) dyeing; (8) recreational; (9) repellent; (10) craft uses (of the wood); (11) sayings and proverbs (in which the plants were mentioned); and (12) miscellaneous uses. Medicinal uses: all uses related to treatment of human diseases, including food supplements and remedies against parasites (e.g. worms, lice). Food uses: in addition to uses strictly related to human consumption, these included the use of aromatic species and those used as coffee and tea substitutes, or for the production of other drinks. Superstitious/religious uses: these related to ritual practices integral to religion (e.g. the ‘infiorate’, production of rosaries, ‘festa del Covo’) or to popular beliefs for the protection of the person, the animals, the house, and the fields. Veterinary uses: species used to improve the health and growth of livestock , to defend against pests, to provide fodder , and to increase the productivity of livestock and poultry (e.g. production of milk and eggs). Cosmetic uses: those concerning the aesthetic care of the body (e.g. skin, teeth, hair), and those used for make-up and perfumes. Domestic uses: those for the care, cleaning and freshening of the home, and plants used as fuel, to preserve foods, and for production of light. Dyeing uses: plants that were used to dye fabrics or work tools, such as for the nets used by the fishermen. Recreational uses: those that were used for the production of toys and for hobbies. Repellent uses: the species that were used to free environments from insects, rodents, and other vermin. Craft uses of the wood: artisan uses of the wood from the plants, such as for the production of tools, furniture, poles (e.g. handles for brooms), and work tools. Sayings and proverbs that mentioned the plants: situations in which the plants had become part of common usage for sayings and proverbs. Miscellaneous uses: all those various uses that did not fall into the previous categories, such as supports for plants, production of rope and vegetable fibre, decorative (floral) uses (excluding domestic ones), and for smoking and ink production, as examples. Various ethnobotanical studies were used as a reference to compare the uses defined in the three study areas in the present study. These articles concerned investigations conducted in the Marche region [23–27], and also in other areas in Central Italy [4, 28–34], and in the rest of Italy [21, 22, 35–45], and in Europe [5, 46–48]. Table 1 gives the details of the information collected, in terms of the scientific names of the species, the local names (where known), the botanical families, and the categories of use, with explanations for the modes of use. Table 1 gives the new uses in bold text, and the new food uses for the Marche region are underlined. Moreover, the bibliographic references are given for each species, with the same or similar uses indicated, and with mention of the same parts of the plants or the different parts used. The focus here instead is only on the new uses, or those that are particularly unusual. In total, 195 species were recorded, as both herbaceous and woody plants for which there was at least one use of ethnobotanical interest. Of these, 184 are wild plants and 11 are cultivated, although used for purposes other than those for which they were cultivated. These 195 species belong to 60 families, among which the most represented were Asteraceae (13.3%), followed by Lamiaceae (7.2%), Fabaceae and Rosaceae (6.7%), and Brassicaceae (5.1%). In total, 120 people were interviewed (30 in the Mount Conero area, 55 in the Osimo area, 35 in the Gola della Rossa–Frasassi area): 82 were women and 38 were men, with ages 32–97 years, and a mean age overall of 75 years. Of these, 65% had only attended primary school, 13% completed lower secondary school, 18% secondary school, and 4% had a university degree. For their occupations at the time of the interview or before they retired, 25% were farmers, 25% craftsmen, 16% housewives, and 15% factory workers. The data concerning the people who were involved in the collection of the plants were only recorded for the localities of Osimo and Gola della Rossa–Frasassi. Here, although the distributions between women, men, and children varied (Fig. 2), the gathering of the plants for the medicinal, food, superstitious/religious, domestic, and dyeing uses was the prerogative of women, while that for the wood and fruit were the task of the men. Generally, the children were mainly involved in the collection of plants for recreational uses, and sometimes for the fruit. The oldest informant reported some particularities for the gathering of some species in the Conero area: Matricaria chamomilla L. could not be gathered by young boys; and those who collected Salvia officinalis L. had to wear a white tunic and could not use iron tools, which would have dishonoured the sacredness of the plants. With regards to the wild plant species used in these three areas of Ancona district, the analysis shows that the species with the greatest number of categories of use here was Sambucus nigra L. (i.e. its use was recorded for all 12 of the categories): the flowers had medicinal and food purposes; the fruit had dyeing uses and were also used in the veterinary sector (‘to revive the colour of the tails of the cows to sell’) and to produce ink; the wood was used to produce tools; and the entire plant had superstitious/religious uses, to name just a few. Among the other species with the greatest numbers of categories of use, there were Matricharia chamomilla L., Salvia officinalis L., Urtica dioica L., Papaver roheas L., and Rosa canina L. (with eight categories of use each). 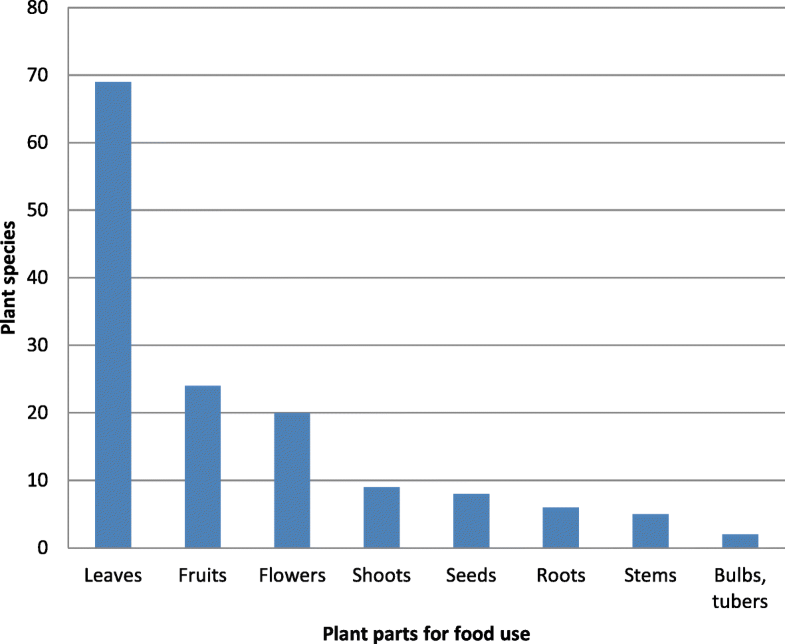 The categories of uses and relative percentages of species are listed in Fig. 3. Of the 195 species considered, 122 had at least one medicinal use. The most used parts of the plants were the leaves, followed by the flowers (Fig. 4). The most common methods of medicinal use were infusions and decoctions, with the use of parts of the fresh plants. The most mentioned diseases were those that affected the skin and the gastrointestinal system, followed by those associated with the urogenital and gynaecological, respiratory, nervous, and cardiovascular systems. The species known for the same medicinal uses in all three areas were Borago officinalis L. against coughs; Elymus repens (L.) Gould. as a depurative; Asparagus acutifolius L. as a diuretic; Ficus carica L. to heal calluses; and Malva sylvestris L. as a laxative. The species with the highest number of different medicinal uses or used for the treatment of several different diseases were Malva sylvestris L. (12 different uses), Foeniculum vulgare Mill. (8 different uses), Matricaria chamomilla L., Olea europaea L., and Parietaria officinalis L. (6 different uses each). The new uses that did not correspond to those in the literature included species used as depuratives and diuretics, like Lunaria annua L. leaves, Salsola soda L. leaves, Galium aparine L. leaves and stems, and Sorbus domestica L. fruit (as a blood depurative). The species used to assist digestion included leaves of Agrimonia eupatoria L., Diplotaxis erucoides (L.) DC, and Diplotaxis tenuifolia (L.) DC. The species used as tonics were Medicago sativa L. leaves and Rumex obtusifolius L. roots. Other new uses were described for Cruciata laevipes Opiz leaves to heal intestinal obstructions, Elymus repens (L.) Gould to heal nose bleeds, Hedysarum coronarium L. leaves as a galactagogue (to promote lactation), and Jasminum officinale L. flowers to heal coughs. In terms of skin diseases, the new uses referred to Medicago lupulina L. leaves and flowers as an infusion as a lenitive and emollient, Rosa canina L. fresh leaves as an infusion to heal wounds, as a cicatriser, Olea europaea L. hot oil to heal calluses, and Crataegus monogyna Jacq dry fruit heated in a small bag and used to heal rheumatic pain. An unusual way to heal arthritic pain was to put crushed leaves of Ficaria verna Huds. on the skin where a blister formed and then had to be pierced. Guarrera  also referred the use F. verna as a “blistering plant”. Some uses were instead contradictory with those given in the literature, such as Vitis vinifera L. leaves as a decoction that was previously cited as a laxative , while in the Gola della Rossa–Frasassi area this was used to heal diarrhoea. Other new uses were similar to those previously cited in the literature, but did not necessarily fully correspond to them, with the details given in Table 1. There were 119 species with food uses, some of which were used in all three study areas for the same use: Asparagus acutifolius L. in omelettes; Cichorium intybus L. as leaves in boiled vegetable mixtures; Foeniculum vulgare Mill. to flavour meat, fish, and olives; Plantago lanceolata L. in boiled or fresh vegetable mixtures; Rosa canina L. fruit in jams, Salvia officinalis L. to flavour meats; and Urtica dioica L. for omelettes and boiled vegetable mixtures, or for seasoning risotto. Among these, Asparagus acutifolius L., Cichorium intybus L., Foeniculum vulgare Mill., and Urtica dioica L. were the most frequently cited species for food uses across the various communities in Italy . Borago officinalis L. and Urtica dioica L. were the most versatile in the kitchen, with seven different preparations. The most used parts were leaves, fruit, and flowers (Fig. 5), and Foeniculum vulgare Mill. was the species with the highest number of parts used. Most of the species (i.e. 50 species) were boiled in vegetable mixtures, sautéed, and served as a side dish, to provide the so-called ‘foje’, which included: Cichorium intybus L., Malva sylvestris L., Papaver rhoeas L., Helminthotheca echioides (L.) Holub., Reichardia picroides (L.) Roth, and Taraxacum campylodes G. E. Haglund Plantago lanceolata L.. In some cases, these also included Capsella bursa pastoris (L.) Medik., Crepis vesicaria L., Echium vulgare L., Hedysarum coronarium L., Plantago major L., Rumex obtusifolius L., Silene vulgaris (Moench) Garcke, Sonchus arvensis L., Sonchus oleraceus (L.) L., and Urospermum dalechampii (L.) Scop. ex F. W. Schmidt. Across the three study areas, Crithmum maritimum L. was only present on the rocky coasts of Mount Conero, where it was widely known: its food use as a “very delicious side dish” has already been documented by Guarrera . The new uses that did not correspond to the literature consulted included some plants that were boiled in vegetable mixtures and served as side dishes, including Lunaria annua L. and Misopates orontium (L.) Raf., which was also used in fresh salads. The species that showed new uses in salads were Veronica persica Poir, and rhizomes of Cynodon dactylon (L.) Pers. as raw in salads (as collected for the Gola della Rossa–Frasassi area); these uses have only been referred to for Spain in famine periods . Other new uses included fried flowers of Achillea collina (Beckser ex Rchb.f.) Heimerl in salted batter. In the literature, the use of this plant as fritters was reported in Sardinia , the use of flowers of A. ptarmica L. in salads for the Bologna area , leaves of Agrimonia eupatoria L. for filling fresh pasta, Calendula officinalis L. flowers in risotto, fruit of Celtis australis L. to flavour grappa, flowers of Convolvulus arvensis L. sucked as a snack, seeds of Elymus repens (L.) Gould and Linum usitatissimum L. for making bread, fruit of Passiflora caerulea L. eaten as fresh fruit, seeds of Sinapis alba L. to flavour pickled peaches, flowers of Tanacetum parthenium (L.) Sch. Bip. and Satureja montana L. for flavouring vinegar, flowers of Trifolium repens L. to flavour bread, leaves of Urtica dioica L. to make a tea, and Mentha sp., and Malva sylvestris L. flowers to make a refreshing drink. The pickling of leaves of Cichorium intybus L. (collected for Conero area) was referred to only the Mediterranean area for Cyprus , with roasted roots of Sonchus asper (L.) Hill. as a surrogate for coffee. In addition to the new uses that are written in bold in Table 1, the new foods for the Marche region are underlined. Across the three study areas, 61 species had one or more superstitious/religious property. Many uses were already known in the literature for the Marche region and for the rest of Italy. However, other uses were not well described, and so it was difficult to find any correspondence with the literature. Various uses were connected with the festivities of San Giovanni on 24 June, among which many were new. The preparation of ‘Acqua di San Giovanni’ (St. John’s water) was frequently cited, and it consisted of putting some vegetable parts and flowers in a basin of water, which was then left outside during the night of St. John (between 23 and 24 June). This water was then used to wash the face the following morning (with some reports indicating before dawn), to be free from the evil eye. Further, according to some informants in the area of the Gola della Rossa–Frasassi, the same water was thrown in a cross along the stairs and in the rooms. The species used were flowers of Hypericum perforatum L., Robina pseudoacacia L., Lavandula sp., Malva sylvestris L., Rosa canina L., and Spartium juniceum L.; leaves of Laurus nobilis L. and Juglans regia L.; shoots of Ficus carica L; and as a new use, berries of Juniperus oxycedrus L. Some of the informants indicated the use of four ears of Triticum turgidum L. placed above the St. John’s water, and this was also a use never reported before. Other rituals not previously described for the feast of St. John for the area of the Gola della Rossa–Frasassi consisted of preparing the so-called ‘forks of St. John’, with branches of Ulmus minor L. that were cut and stripped of the bark to be formed like the forks used with the straw, which were then placed outside the door as a good omen for the wheat harvest. Another new use, and for the same area, was to make a cross by tying some branches of Ficus carica L. together that were put outside the door on the night of St. John, to protect from witches. Stems of Artemisia vulgaris L., Ruta graveolens L., Rosmarinus officinalis L., and Lavandula sp. were put into the pockets or under the pillow to protect against witches during the night of St. John. The stem of Artemisia vulgaris L. provided protection when travelling. Some flowers were used in the so-called infiorate, where drawings were designed on the ground along the streets where the Procession for Corpus Domini passed. The species used included Bellis perennis L., Calendula officinalis L., Lavandula spp., Robinia pseudoacacia L., Rosa canina L., Wisteria sinensis (Sims) Sweet, and Hedysarum coronarium L., with the new use recorded for Cota tinctoria L. J.Gay. and Matricaria chamomilla L.. Triticum turgidum L. was used (and indeed is still used) to create allegorical waggons and decorations for the ‘Festa del covo’, a religious celebration that is held in August in the Osimo area. Some of the other new uses with no correspondence in the literature consulted included to keep the aerial parts of Achillea collina (Becker ex Rchb.f.) Heimerl in the pockets to protect against haemorrhoids. Conversely, plants of Arum italicum Mill. that grew near the house were weeded out to remove them, because the spots on the leaves were correlated to the blood of Jesus and the plant was believed to bring bad luck. Furthermore, some branches of Olea europaea L. were held in the hand to find lost things, with a prayer to Sant’Antonio (‘Sacre Sponzole’) recited. Also, a large stock of Vitis vinifera L. wood was burnt on the fire on Christmas Eve, and then allowed to burn slowly every day until 6 January, with the still-burning logs placed in the vineyard while reciting the phrase ‘Vita mia non te ‘rrugà, t’ho portato u ceppu de Natà’ (‘Oh my grapevine, don’t perish, I have brought you the Christmas log’). The religious uses also included the production of rosaries, and the new plant use here was for seeds of Robinia pseudoacacia L.
Across the three study areas, 53 species had a veterinary use. Among the species that were administered as feed, new uses included Ailanthus altissima (Mill.) Swingle leaves, for feeding silkworms; leaves of Celtis australis L., for cattle; Medicago lupulina L., Myosotis arvensis (L.) Hill and Silene latifolia subsp. alba (Mill.) Greuter and Burdet leaves for various animals; Populus alba L. dried leaves as winter feed for rabbits and sheep; and Rosa canina L. fruit to feed hens. Other species were administered as curative feed, with the new uses including Cichorium intybus L. leaves, to heal intestinal worms in rabbits; and Hypochaeris achyrophorus L. roots, as feed for pigs and leaves for cattle, as a galactagogue. An unusual use of the bulb Allium neapolitanum Cirillo was to macerate it in wine to heal rabies in dogs. Some species were used as external curatives, such as Crataegus monogyna Jacq. fruit as a poultice was used to heal ‘spallone’ in cattle (bruising caused by the ‘giogo’-yoke). In the literature consulted, many other species were used to heal these kinds of diseases . Some species were given as feed for dairy cattle to flavour their milk, including Alliaria petiolata (M.Bieb.) Cavara and Grande leaves, and Lavandula spp., Rosmarinus officinalis L., and Salvia officinalis L. A particular use in the Gola della Rossa–Frasassi area was to dye the tails of the cows to be brought to the market, to make them brighter, using an infusion of Sambucus nigra L. fruit. The cosmetic uses recorded included 30 species. Among the uses in terms of hair care, one that was new and particular related to lacquer made using Pinus pinea L. Here, the pitch was boiled and mixed with alcohol and then put into a spray container so that it could be sprayed on the hair as a kind of lacquer. Other new uses were for leaves of Clinopodium nepeta (L.) Kuntze that were chewed to heal bad breath, flowers for a decoction of Cornus mas L. to heal oily skin, and leaves and flowers as an infusion from Veronica persica Poir. to refresh the face. An unusual use of Ficus carica L. latex was recorded in the Osimo area, where it was used to darken the skin. Twenty-seven species had various domestic uses. Among these, some plants were used to light fires and for wood to feed fires. The new uses here were for Ailanthus altissima (Mill.) Swingle, Ceratonia siliqua L., and Prunus avium (L.) L.
Some other new uses also included domestic floral decorations, such as Allium neapolitanum Cirillo, Morus alba L., and Passiflora caerulea L. flowers in fresh floral decorations, and Aloysia citriodora Palau., Amaranthus retroflexus L., and Nigella damascena L. flowers and Lunaria annua L. stems with siliquae (dried seed pods) as dried floral decorations. Then there were the species used to perfume rooms and drawers, with the new and particular use reported for Rosa canina L., the petals of which were infused in water together with cloves and salt, to make a solution that was sprayed over the hot stove to spread the vapour through the kitchen and freshen it. Matricaria chamomilla L. flowers were also used to perfume drawers. Other domestic uses concerned those for producing light, for detergents, and to preserve apples. Dyeing uses were reported for 17 species. The new uses that did not correspond to any in the literature consulted included Cichorium intybus L., Salvia verbenaca L., and Stachys officinalis (L.) Trevisan to dye clothes yellow; Cruciata laevipes Opiz roots as a red dye; Geranium dissectum L. leaves as a brown dye; and Plantago lanceolata L. leaves as a green dye. The cooking water of Asparagus acutifolius L. shoots was used to dye fishing nets green (reported for the Conero area). In the three areas, 17 species had recreational uses. The new uses that did not correspond to any in the literature consulted included ears of Elymus repens (L.) Gould., which children used to detach them one by one to see if a desire would come true, and acorns of Quercus sp., which were used for dolls’ eyes, with the galls used for marbles. Leaves of Trifolium pratense L. were used to guess where a storm was coming from, which depended on the direction in which they were oriented. Fifteen species were cited in the three areas for their repellent uses against parasites or other damaging pests, to prevent harm coming to garden plants, or to the house, the granaries, and other stored food. The new uses here that did not correspond to others in the literature consulted included bulbs of Allium neapolitanum Cirillo and leaves of Artemisia vulgaris L., which were macerated in water to keep parasites away from the orchards; and leaves of Melissa officinalis L. and Thymus vulgaris L. put in the drawers to protect against moths. A very particular use was for some plants of Pastinaca sativa L. subsp. urens (Req. ex Godr.) Celak. that were left to grow around the orchards to keep thieves away, on the basis of their urticant (i.e. itching, stinging) effects. Ten species were cited where the wood was used to make tools for agricultural, kitchen and other work activities, and for various objects for the house and the stables, and for furniture. Among the most useful woods there were Acer campestre L., Ostrya carpinifolia Scop. and Quercus sp., while the use of Ailanthus altissima (Mill.) Swingle as wood for making various tools was new, as also for Cornus mas L. for making boats. Particular uses included Arundo donax L. stems to make ‘mazzarello’, a tool to support knitting pins, and Ulmus minor Mill. as wood to make the stick used to turn polenta. Most proverbs and idioms in which plants or parts of plants were mentioned referred to events in the agricultural life, such as the crop phases and the seasons of the year. These included, for example, ‘ (‘Lots of figs, little wheat’: in a year where a lot of figs were produced, there would be low production of wheat). Other cases might associate a person’s behaviour with the characteristics of a given plant, such as ‘Essere come l’erba cattiva’ (‘To be like bad grass’), which actually referred to the nettle, which was known as ‘bad grass’ locally due to its sting. In other cases, the proverbs still summarise the uses or qualities of a plant, such as ‘La ruta fa venì la vista acuta’ (‘Rue improves the vision’), which refers to the use of the plant to improve the eyesight. 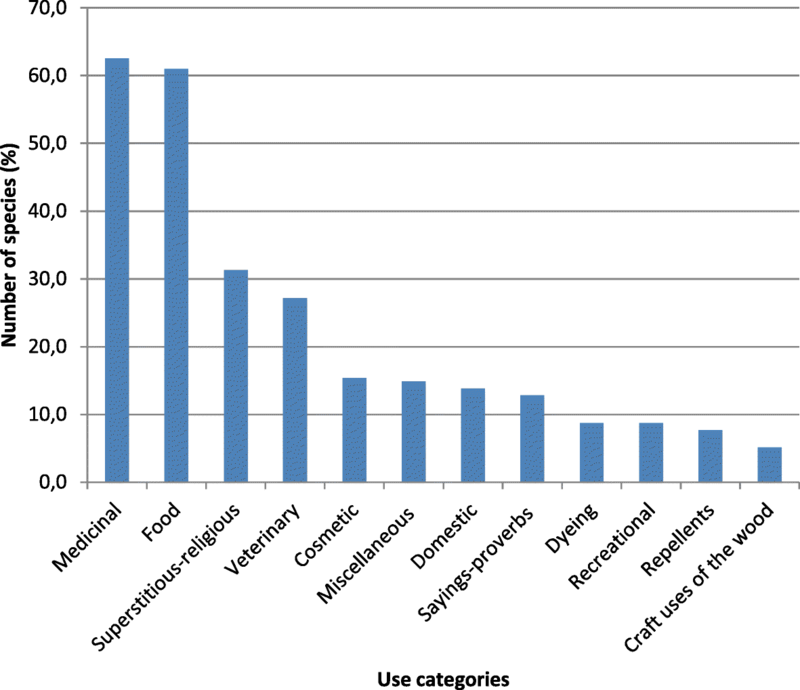 Twenty-nine species were classified as having miscellaneous uses, which included those that do not belong to the other categories defined here. Some of these related to species that were used to make various ropes or cords, for agricultural use and for the home. For these uses, there were Ceratonia siliqua L. and Polygonum aviculare L. stems, and Robinia pseudoacacia L. roots. New or unusual uses were also seen for the resin of Pinus pinea L. to produce turpentine and for the plants that were used for wedding bouquets, such as the flowers of Calystegia sepium (L.) R. Br. and Lunaria annua L., while the flowers of Calepina irregularis (Ace) Thell and Robinia pseudoacacia L. were used to make the bride’s bouquet. The other uses included in this category were the species where leaves were used as tobacco substitutes, for curdling milk and to produce ink. Some of the local names were different across these three study areas. For example, Plantago lanceolata L. was called ‘lingua di cane’ (dog’s tongue) and ‘orecchie di pecora’ (sheep’s ears) in Osimo, ‘orecchie d’asino’ (donkey’s ears) and ‘recchiole’ (little ears) in the Mount Conero area, and ‘orecchie di pecora’ (sheep’s ears) and ‘centonervi’ (a hundred nerves) in the Gola della Rossa–Frasassi area. Sometimes, the same local name was indicated for different species and genera, such as ‘grugno’ for Cichorium intybus L., Helminthotheca echioides (L.) Holub and Urospermum dalechampii (L.) Scop. ex F.W.Schmidt; and ‘speragna’ for Helminthotheca echioides (L.) Holub and Picris hieracioides Sibth. and Sm. The local names of the plants are given in Table 1. The surveys carried out in these three study areas in the Ancona district led to the identification of ethnobotanical uses for 195 species, 184 of which were wild and 11 were cultivated. The three areas were different in terms of their economic and phytogeographic characteristics, but all of these areas were united in that they have suffered depopulation of the countryside since the 1960s, as for the rest of the Marche region and the whole of Central Italy in general. The consequence of this has been the disintegration of rural society and the loss of traditional local knowledge. We believe that our survey can increase our present-day knowledge of the traditional local uses of plants, which now allows us to preserve this knowledge, not only in terms of medicinal and food uses, but also for ethnobotanical aspects as a whole. Some of the uses recorded here are common to all three survey areas and are also common to other areas of Marche and Central Italy, while others appear to be particularly unusual, and even new, with no previous mention of them in the literature. 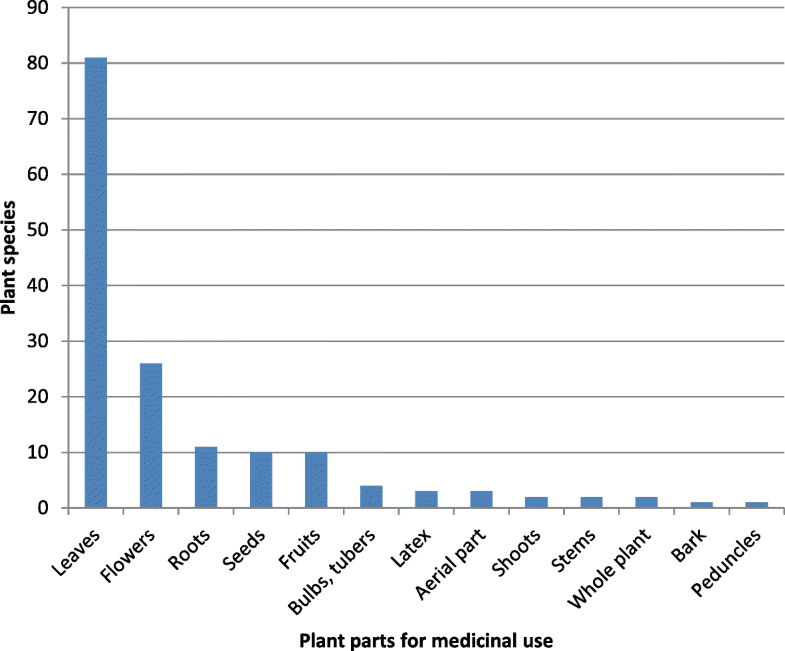 The plants that were cited for medicinal uses were most numerous. Malva sylvestris L., Foeniculum vulgare Mill., Matricaria chamomilla L., Olea europaea L., and Parietaria officinalis L. were best known for their curative uses across the three study areas, which is in line with the rest of Italy. However, the medicinal uses of 19 species were new. For food uses, those most noted were Asparagus acutifolius L., Cichorium intybus L., Foeniculum vulgare Mill., Plantago lanceolata L., Rosa canina L., Salvia officinalis L., and Urtica dioica L. Many food uses were similar to those mentioned in the literature, while among the most unusual here was the use of raw Cynodon dactylon (L.) Pers. in salads (for the Gola della Rossa–Frasassi area), a use that has only been reported for Spain in periods of famine . For the veterinary uses of plants, the most unusual was that to ‘revive’ the tails of cows that were due to go to the market, to make them brighter, which was provided by an infusion from the fruit of Sambucus nigra L.
The most diffuse superstitious/religious uses were those of St. Johns’s water and the infiorate. The high number of new superstitious/religious uses arises because only a few of the literature references consulted have referred to this type of use. Among the most significant new and unusual uses were the branches of Ulmus minor L. and Ficus carica L. that were used to make the so-called forks of St. John and the crosses to hang outside the house during the night of St. John, respectively. Among the other new and unusual uses were the cosmetic use of the Pinus pinea L. pitch to make a hairspray, the domestic use of the petals of Rosa canina L. to produce a water with which to freshen the house, and the repellent use of the plants of Pastinaca sativa L. subsp. urens (Req. ex Godr.) Celak. to protect the garden from thieves. In conclusion, we believe that the large and varied amount of data collected here is particularly useful for its contribution to the knowledge of how plants were used by the rural societies that were widespread throughout the Marche region until the second half of the 1960s. The uses of these plants were necessary to promote the self-sufficiency of these populations in terms of their domestic and agricultural practices, and their homecare, personal care and animal care, and for their own sustenance. At the same time, we would emphasise the need to identify more than one area within even just the Marche region (here as coastal, hilly, mountainous) to provide a more complete view of the traditional knowledge that was spread throughout the territory and to allow comparisons between such areas. The authors would like to thank those who contributed to the data collection for these surveys, and in particular S. Massaccese, C. Serini and K. Zajko, and all of the informants who agreed to take part in the survey. All data generated or analysed during this study are included in this article and in its Supplementary Material Table. Voucher specimens are stored at the Herbarium Anconitanum (ANC) of the Department of Agricultural, Food and Environmental Sciences of the Polytechnic University of Marche (UNIVPM). The authors contributed equally to this work. All authors have read and approved the final manuscript. Prior oral informed consent was obtained from all of the study participants. Permission of the Ethical Committee was not required. Permission was not required to collect the voucher specimens, and no plant samples were collected in the areas under the protection of the Regional Park of Conero and the Regional Park of Gola della Rossa–Frasassi. Anselmi S. L’agricoltura marchigiana nella dimensione storica. In: Rivista di storia dell’agricoltura. Accademia Economico-Agraria dei Georgofili, Firenze, vol. 2: anno XXVI; 1986. p. 1–103. http://rsa.storiaagricoltura.it/scheda.asp?IDF=83&IDS=3&IDP=1.